Cathy's Card Spot: Happy Birthday Mo! Hi, It's my sister Maureen's birthday ! YAY! I visited her earlier this week and gave her this card so it's ok to post it now. We had a lovely catch up. I stamped the background ages ago - white ink, clear embossed. (Thanks again for the loan of the stamp Amanda). I distressed it with a few greens and a blue. I've used my all time favourite butterfly stamp from Hero Arts Antique Engravings set. The flowers were punched from some dp that Mo gave me years ago. Her resolution this year is to use up some of her stash on every project. I think I'll try and get through some of mine too! I'm going to link up to some challenges. At Addicted to Stamps & More the theme is to Make Your Mark. I coloured my butterfly with my Prismacolor pencils and blended them with odourless mineral spirits and a blending stump. I love this technique, the colour just melts as you blend it. At Cuttlebug Mania the theme is distressed. You also need to use a manual die cutting/ embossing machine. I used my cuttlebug to cut the Memory Box Madeira Corner dies. I distressed them with pine needles and forest moss distress ink to get them to match my base card. At Make It Monday the theme is anything goes and to share creativity. Materials used: Stampin Up Weathered bg stamp; Hero Arts Antique Engravings butterfly stamp; Versafine & Versa color ink & clear embossing powder; Distress inks; Prismacolor pencils; Memory Box Madeira Corner die; Carl flower punch; stickles; sentiment sticker & bling from stash. Oh Cath I just love this. The colours and the design are just wonderful. No wonder your sister loved it. I do too! PS Boofle is a bear made out of Grandad's old cardigan!! That is what it says on the label! I love how that beautiful butterfly stands out against the pretty background! How lovely to have a sister that shares this hobby! I know she loves this card! What a beautiful card! Love how you did the background! And those delicate corners... Just gorgeous! Beautiful card- I would never have thought to put green and lilac together-but they look fabulous! Oh Cathy, this is gorgeous. I love that background and the corners, also those petite little flowers. Heard on a morning program today that it was so hot thee that bats fell out of the sky! Wish I could send you some of our cold to cool you down. This is simply lovely! I saw your card at MIM. The purple butterfly looks fantastic against the green background. I think your card is really beautiful, I spotted it on MIM. Very pretty card Cathy, I love the color combination at lot :) thank you joining in the fun at ATSM!! Cathy this is just sooo awesome back to read it carefully. This is such a pretty card. Happy bday to your sister. Thanks for sharing your creation with us at Make it Monday. What a fabulous card. Teh fancy, intricate dies looks good with the fab crackled look on the card. Love how you did that, by the way! 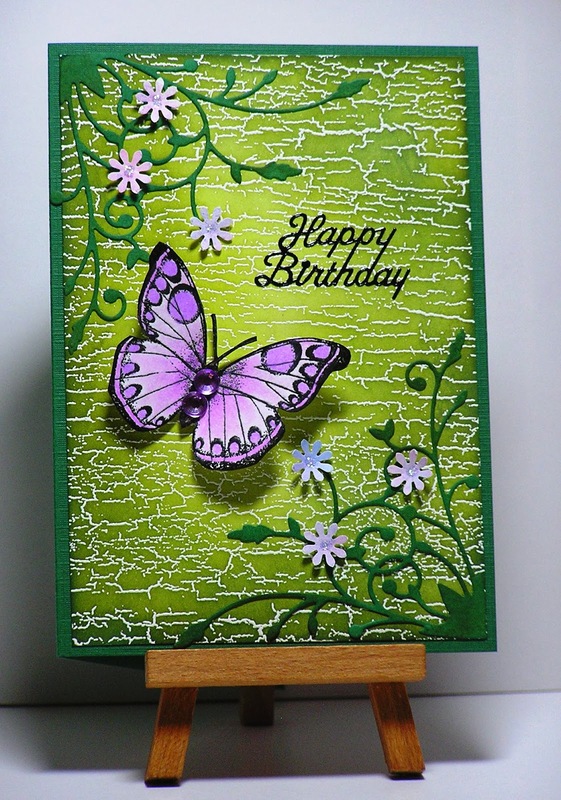 The butterfy certainly does looks so nicely blended and looks beautiful on your card. Very beautiful! I love the background. Thanks for joining us at ATSM this week! I love your card! The colors are so bright and beautiful!! Thank you so much for joining us at Cuttlebug Mania's challenge "Distressed"